Following on from last Monday's post on The Miracle Maker, I re-watched the final half hour with Nina over the course of the Easter holiday, and, once again, I noticed some new details that things I've missed previously. The initial decision facing the film-makers at this point is whether or not to mirror Leonardo's famous painting, as this is the definitive artistic image of the Last Supper. However, in most cases, where a Leonardo derived composition has been rejected, a more modern arrangement is taken with all the disciples around two or more sides of long tables. It's noticeable for example that Jesus films never show all the disciples eating at separate tables all within the same room, even though John's gospel happily accepts Jesus did not treat all his disciples equally (John 13:23-25). Almost without exception the disciples are pretty much treated equally. 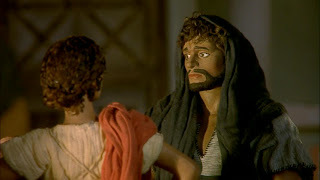 However, film-makers are also at pains to visually highlight the other-ness of Jesus, so, as far as I am aware, no film-maker has ever located the Last Supper on round table as per King Arthur - in fact Jesus is always seated centrally, even though that is only assumption based on traditional Christian Art and the assumptions drawn from our culture. In light of these comment I'm surprised that I've not noticed the layout adopted by The Miracle Maker, whereby Jesus and his disciples sit down one side of a Leonardo Da Vinci style top table, but there are various other tables in the room where people like Cleopas and Mary Magdalene sit. IT's shown here before the disciples arrive. Such an arrangement deftly combines the oneness of Jesus's new community with his own uniqueness and importance, as well as bridging between traditional depictions of the Last Supper and Twenty First Century sensibilities. It's also interesting that, it's difficult to ascertain where exactly Jesus sits at the table. It would appear to be in the corner nearest the door, rather than in the middle. In my father's house there are so many rooms, I'm going to find a wonderful place for you. One day you will always be with me. What struck me about this is that it's these words that Tamar repeats into the camera at the end of the film. That scene is the worst of the whole film, but the subtle exploration of the oral tradition around Jesus's words, and the way they are spread from one to another is certainly interesting. Finally, I've often talked about how this film switched to 2D animation to indicate that the story is moving to a "state of mind" - flashbacks, parables, temptations, and so on. But what struck me for the first time is that the sighting of Jesus by Mary Magdalene by his tomb, and the majority of the other post-resurrection appearances, are shown in "factual" 3D. In other words the decision to use 3D here is very much a theological one: the resurrection is portrayed as an actual historical event rather than the non-literal, shared conciousness, of some other interpretations. 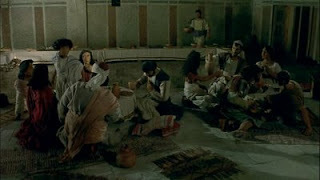 The film most known for a non Da Vinci arrangement is Jesus Of Nazareth --three round tables with Jesus not central but at the extreme right leaning against the wall . Another film KING OF KINGS around a type of cross with Jesus at the intersection of the three tables . Thanks for that. I'd somehow overlooked Jesus of Nazareth, but FWIW, the comments from my earlier self as quoted above were from something I was writing on King of Kings. Plus where a reader spoke up against Harry Potter. As a Christian I wish to state that the Bible clearly tells us to have nothing to do with witchcraft. When I was 14 years old I had the most terrible experience. For a long time I heard voices that repeated over and over:'Harry must go. 'As a Christian I would like to warn people who are crazy about Harry Potter. Rather stay away before you also have to experience the trauma that I did. will keep on praying for their salvation. Not sure if you know this, but the Miracle Maker is available to view at hulu.com. You can watch it at a pretty good quality too. I wasn't actually Victor, thanks for that.